Following submission of their applications and the decisions made by the panel of judges, the 2016 Commitment Award awarded three projects funding to pursue their projects. First place went to “Water for Small-scale Farmers”, a group supporting farmers in Shybran, a rural village located in Southern Kyrgyzstan. The project seeks to educate these small-scale farmers on how to combat water shortages through a method known as “Rainwater Harvesting” (RWH). The “Water for Small-scale Farmers” consists of three members, Daniar Matikanov, Batrbek Alymkulov and Aiperi Otunchieva. Their program will train farmers in conservation techniques and assist in the construction of RWH structures. By so doing, the program will improve water collection and storage capabilities, increase farmers ability to conserve water and thus mitigate the effects of arid times on their crop production. Second place was awarded to Harini Suresh and her project titled “Save our Future”. Harini designed her project so as to spread awareness regarding the consistent issue of child abuse in her city Chennai, India. “Save our Future” specifically targets children in grades 1 through 5 and adults in the low-income community. The “Save our Future” program utilizes Harini’s connections with Teach For India and will be implemented within government schools/low-income private schools. 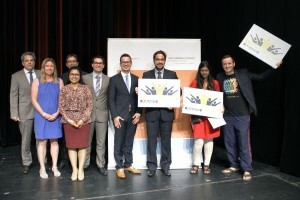 Third place was awarded to Grigoriy “Grisha” Grigoryev and his project “Computer School in the Sub-Saharan Village in Mozambique”. Grisha and his project seek to open the first computer school in Marrupa, Mozambique, this school will utilize the inexpensive Raspberry Pi computer. This computer provides an excellent opportunity for students in the area to learn coding, how to create programs and how to use other open source software. Grisa is support by one of his former students, Jafar Binasse, who has graduated from the 12th grade and is currently enrolled in the first online university program in Mozambique.